I love a good old fashioned comfort meal every now and then and this definitely fit the bill! I made 3 pot pies (I added extra of each ingredient to have extra filling), one for us and two to take to people, so it was a good thing it turned out so yummy :-), but I knew the Pioneer Woman wouldn't let me down! I only wished we'd had more leftovers! - Preheat oven to 400 degrees. - Finely dice celery, carrots and onions. - Melt butter in a large pot or dutch oven over med heat. Add the onion, carrots, cleery and peas. Saute until the vegetables start to turn translucent, a couple of minutes. - Add chicken and sprinkle the flour evenly over and stir to combine Cook e for a couple minutes, stirring gently. - Pour in chicken broth, stirring constantly. Stir in teh bouillon cube and wine. The flour will combine with the chicken to create a gravy. - Pour in the cream and stir. Allow the mixture to cook over low heat, thickening gradually. Season with the thyme, salt, and pepper. Remove from teh heat. Taste and adjust the seasonings as needed. 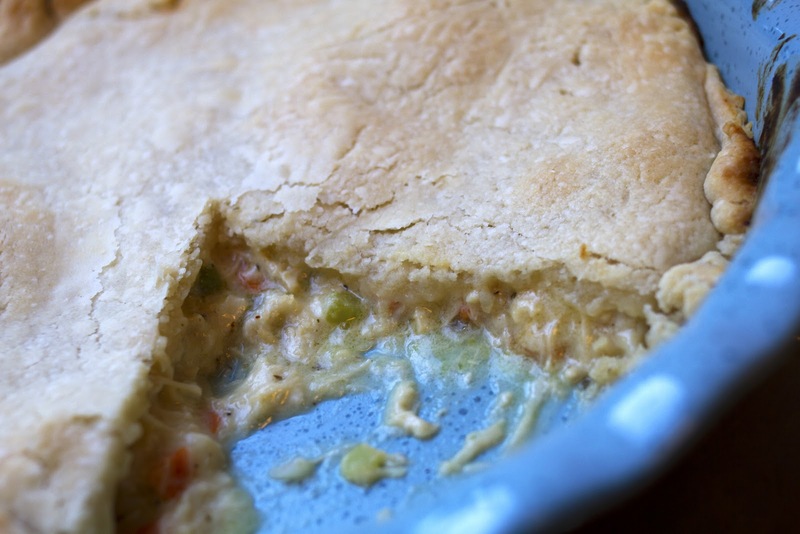 - Pour the chicken mixture into a deep pie pan or small casserole dish. - Roll out the crust so that it's 1 inch larger that the pan. Place the crust on top of chicken mixture and cut small slits in the top. Press the crust gently into the sides of the dish to seal. - Bake for 30 minutes, or until the crust is golden brown and the filling is bubbly. Cool for 10 minutes before serving. This looks great. I've been wanting chicken pot pie. Is this recipe supposed to make 1 or 2 pies? I just realized when typing in the recipe that it is only supposed to make 1...I thought it made two, so ours didn't have quite as much filling and I'm sure it's even better when you do it right! Thanks so much for the recipe. I must admit...it was so easy to make. Tonight is the 2nd time I've made this & I have been craving it since the 1st time I made it!!! I have been wanting to make chicken pot pie homemade for some time now! I will be getting to work on it right away because it is now a favorite of my granddaughters now ❤️ Thanks again !! !